In March I reviewed a wonderful book called Soup Swap by Kathy Dunst (Here is the link: https://wp.me/p82Ooe-5Gh). I went through all the recipes (except those with meat) and earmarked 2 or 3 more to try. 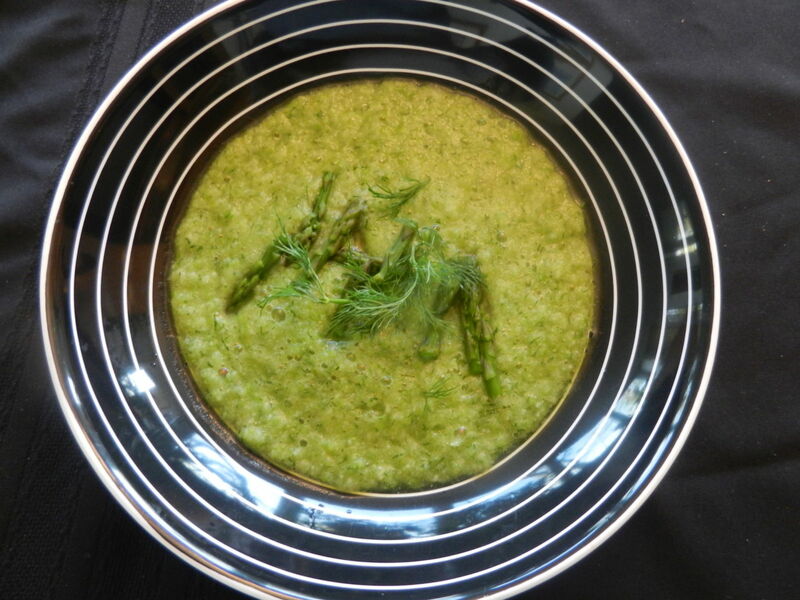 I tried the asparagus soup and it was good, but too thin for my taste, so I decided to create a thicker asparagus soup with cauliflower and dill, both of which I had on hand. It came out the texture I like, so here is my recipe for Spring Soup. 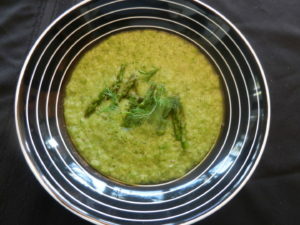 But I had never made asparagus soup before and Kathy’s recipe was the inspiration. Thanx, Kathy Dunst! P.S. Asparagus is in season, and one of the recommendations from Earth Day supporters is to eat food in season and locally grown, organically, when possible. So I placed this under the Home Page, Kitchen Nutrition, and Earth Day. Note: You can choose to use more asparagus and less cauliflower or equal amounts. Lots of wiggle room here. Wash cauliflower well and break off enough florets to equal 6-8 ounces (about 1/2 of a medium-sized cauliflower.) Cut into small pieces and cook in about one cup stock or water in saucepan for about 15 minutes. Remove the cauliflower when it can be pierced with a knife (need not be totally cooked.) and place in food processor or blender and let water cool down. Remove asparagus, cut off the tips and set them aside. Chop the cooked stems (not the hard ends that will be used for stock) in half and add to the blender/food processor. Let stock cool down in pan. While the stock is cooling, wash and chop the dill, removing their stems first. Add to veggies in blender. Serve hot and garnish with asparagus tops and additional fresh dill. Enjoy! (You can also serve it chilled in summer with a dollop of sour cream or yogurt. )Yield: Two servings if using bowls, four if using cups. Quite a line-up of important nutrients. Maybe I should have called this recipe Spring-into-Nutrition Soup! This entry was posted on Wednesday, May 16th, 2018 at 2:22 pm	and is filed under Earth Day, Every Day, Home Page, Kitchen Nutrition. You can follow any responses to this entry through the RSS 2.0 feed. You can skip to the end and leave a response. Pinging is currently not allowed.